Using SmartView add-in, we can create OBIEE reports from Excel/Word and save in OBIEE catalog.And we can see those reports within OBI Presentation services and can use it for further analysis. To create an OBIEE report from excel, follow these steps. To create a new analysis from SmartView, Open Excel and connect to Oracle BIEE. Navigate to Oracle BI EE tab. And then click on “View Designer” button. The View Designer button will open the Oracle BI EE presentation services Subject Areas. 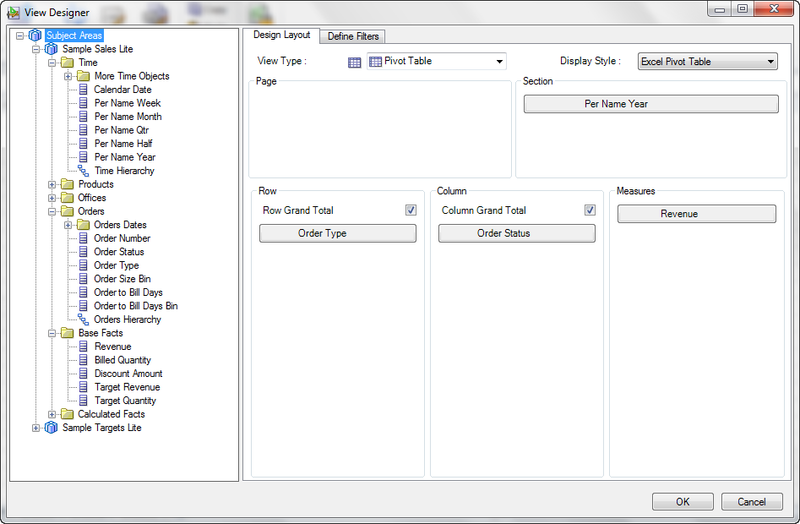 Expand the Subject Areas of your choice and drag the columns of analysis into the areas of report layout. 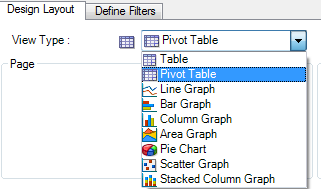 The SmartView has variety of View types, for demonstration purpose I am using Pivot table. In my example I am creating a pivot table, so dragged the Order type in Rows, Order Status in Columns, and Revenue in Measure block. And I am grouping the result set by year, so moved the Per Name Year in Section part. Now to save this report in OBIEE catalog, click on publish View button. It will open the OBIEE catalog folders. 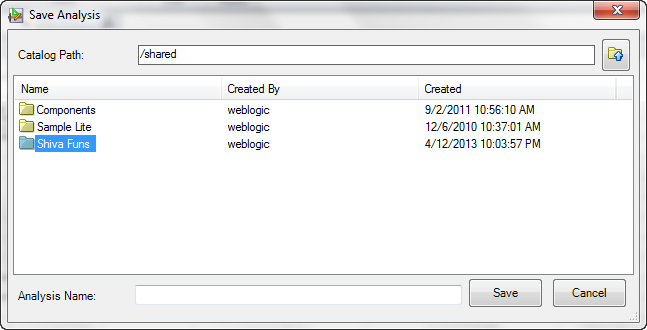 You can save the report into a folder of your choice that created in OBIEE catalog. Select the Folder in OBIEE catalog and give a name to report and click save. See how the report is rendered in OBIEE Presentation services. 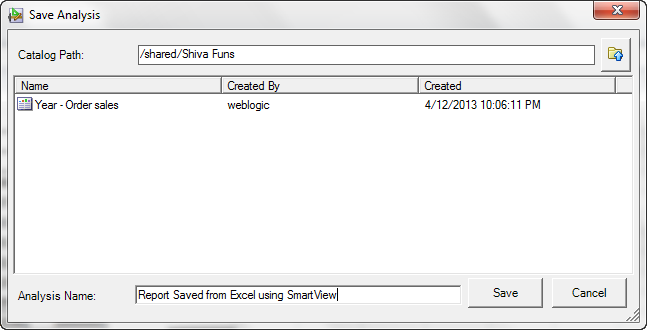 There are many scenarios where we could use this powerful SmartView Add-in for a great flexible usage of OBIEE reports. Oracle Hyperion Smart View for Office Integration. SmartView is much more powerful than its well-known predecessor, the Hyperion Excel Add-In. It not only connects to Essbase, Hyperion Planning, and now to Oracle BI EE. The Smart View 11.1.2.2 Add-in replaces the Oracle BI Office Add-in as the primary Office application for Oracle BI Foundation. For benefit of the users, both are still available with OBI 11.1.1.7. Smart View allows users to connect to Oracle BI EE server and utilize the content created in Oracle Business Intelligence Answers dashboards and analyses. In addition to working with pre-created content, Smart View users can create ad hoc queries in the form of simple views with the View Designer, using Oracle BI EE Presentation Server as the data source. The views created can then be published to the Oracle BI EE Presentation Catalog, where they can be edited further. Connect to Oracle BI EE Presentation Server. Navigate through the Oracle BI EE Presentation Catalog. 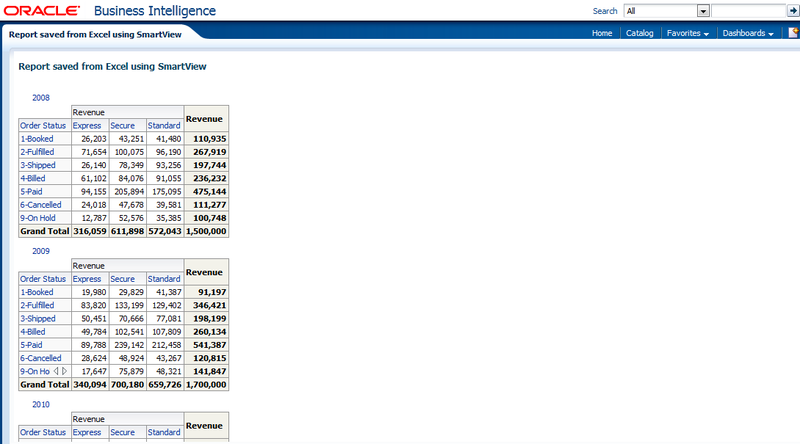 Insert Oracle Business Intelligence tables, BI pivot tables, and BI graphs into Excel as refreshable, editable objects. 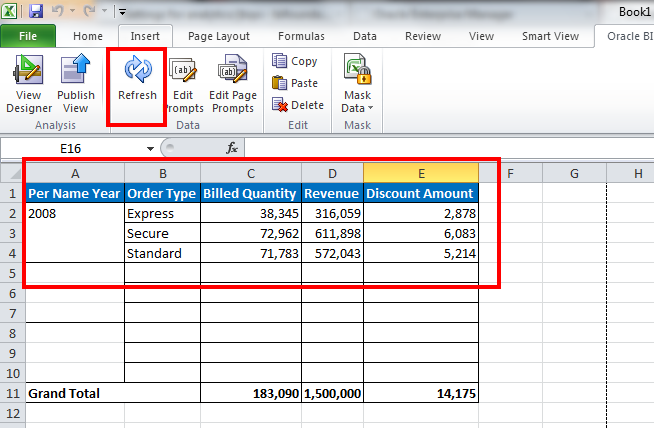 Apply Excel formatting to BI data; formats are retained when you refresh. Copy Oracle BI EE Dashboard content and paste it into Smart View client documents. The data, metadata, and view layout are copied. Create simple views in Excel using Oracle BI EE Presentation Server as the source for metadata and data. Interact with content imported into Smart View documents, such as prompt selections. Manage the imported content in Smart View; for example, refresh, mask, copy and paste, and document contents. Mask BI data from Oracle BI EE objects in Office so that users must log in to view the data. Masked objects can be viewed upon refresh. You can use Visual Basic to program your own Oracle BI EE interfaces. EditPrompts—Edit the prompts of a view. EditPagePrompts—Edit the page selections of a view. GetPrompts—Get prompt values of a view. GetPagePrompts—Get page selections of a view. DeleteView—Delete a view in an Office application. DirProperties—Fetch properties of a directory. In Oracle BI EE Analytics Home page, click the arrow next to Download BI Desktop Tools, and then select Smart View for MS Office. Click Run to run the installer directly. If the User Account Control dialog box is displayed, click Yes, and then continue to step 3. Click Save to save the Smart View installer file to a directory to which you have access and from which you can run executable files. Open the folder where you saved the Smart View executable and double-click it to run it. Then continue to Step 3. Select the language to use for the installation wizard. Follow the prompts in the wizard. When installation is complete, click Finish. Smart View is displayed the next time you open Microsoft Excel, PowerPoint, or Word. 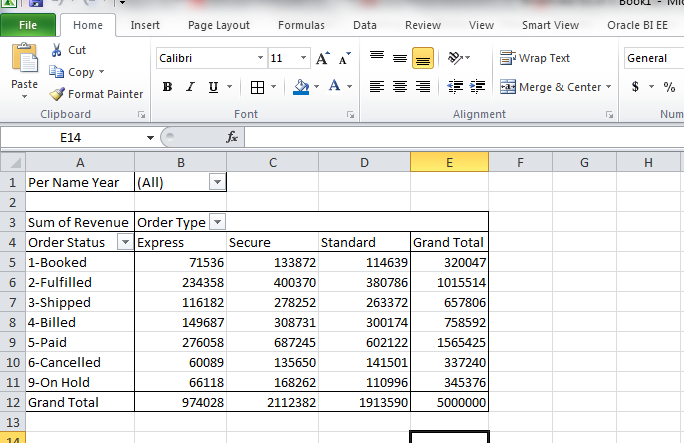 This blog post explains how to connect to OBIEE11G Reports from Excel spreadsheet to analyze more with help of Excel native functionality. Connect to OBIEE from SmartView and insert this report in Excel spreadsheet. 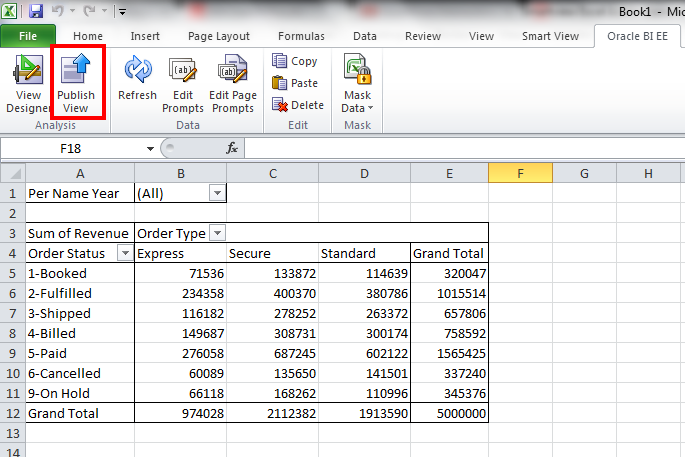 Once you imported the OBI Analysis view, you can use all native Excel features (e.g. 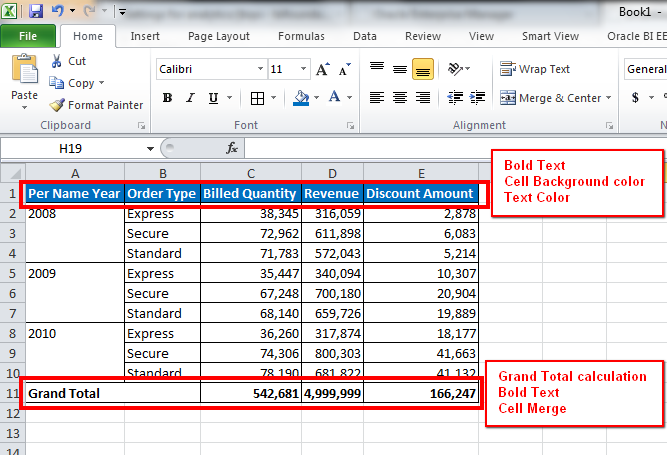 Cell formatting, Text formatting, Excel functions like Sum,Avg, Min,Max and any other functions etc..). If we apply any changes to OBI analysis in presentation services, the formats applied in spreadsheet retain same and just the data will be refreshed with respect to the OBI Analysis updates. 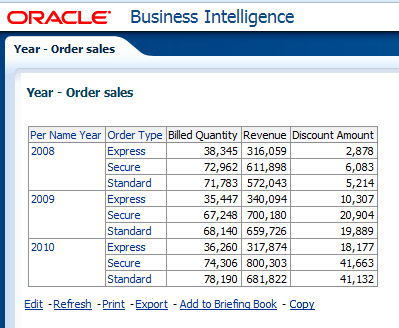 In following example I have applied a filter on year = 2008 in OBIEE presentation services.